Since it is the holiday season and many people are cooking and baking special recipes to share or give as gifts, I thought that I would share a healthy oatmeal cookie recipe with you that came from my grandmother. It uses the old-fashioned Quaker oats, not the quick-cook kind, nor the instant. Why did I label this a healthy oatmeal cookie? Despite the fact that it does contain shortening and sugar, it also has a proportionate good amount of the old-fashioned oatmeal and also nuts and raisins, all three of which have health benefits. Obviously sugar substitutes could be utilized for people who are diabetic or need to watch their sugar intake for one reason or another. But for people who wish to indulge and enjoy an occasional cookie I can highly recommend these delicious Quaker Oats oatmeal cookies. Many people would have these simple ingredients on hand in their pantries and this oatmeal raisin cookie recipe is easy to prepare. Cream the shortening with the sugars, egg, water and vanilla. Beat until smooth, about 2 minutes. Add the flour to the creamed mixture and fold in the oatmeal and nuts. Form into small balls and place on greased cookie sheets. Bake at 350 degrees Fahrenheit for 12 to 15 minutes. I find that if you chill the batter for an hour or so in the refrigerator it is easier to form into balls and becomes less sticky. 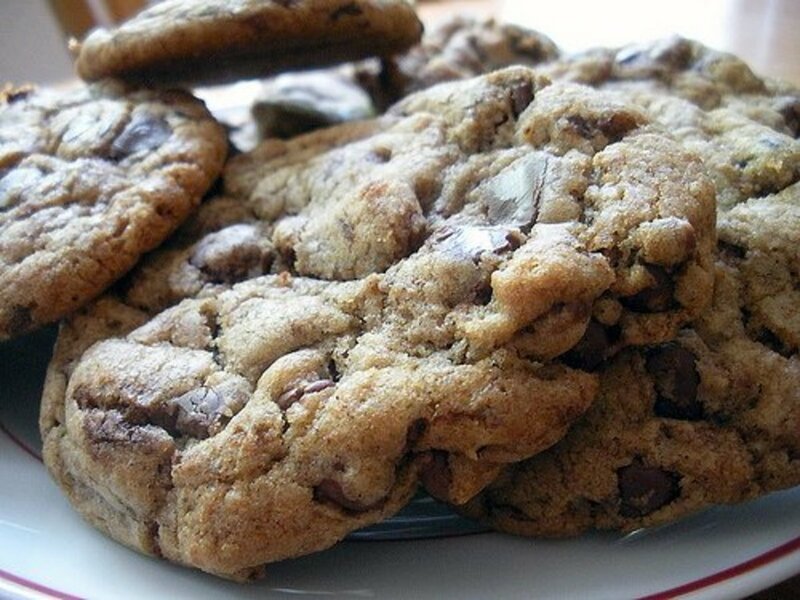 These cookies bake well in a convection oven...just watch the timing. They bake in about 11 to 12 minutes...but every oven is different. There are many health benefits to eating oatmeal, raisins and walnuts. Oatmeal has the effect of lowering the risk of heart disease by providing soluble fiber which lowers the LDL cholesterol which is the bad kind. 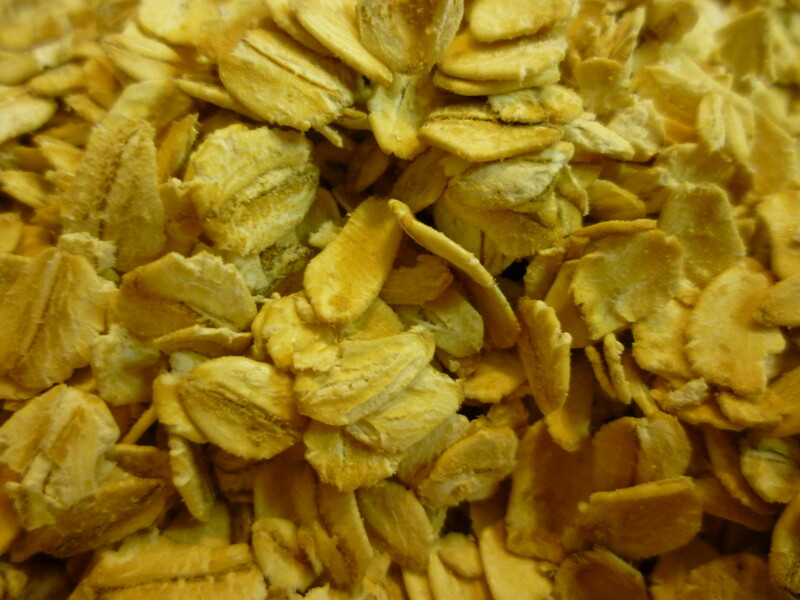 It also provides many vitamins and minerals and is a good source of protein. Nuts like walnuts, also help to lower the LDL cholesterol thereby helping to lower heart disease. Nuts also provide a good source of fiber and protein and contain the good fats called omega 3. 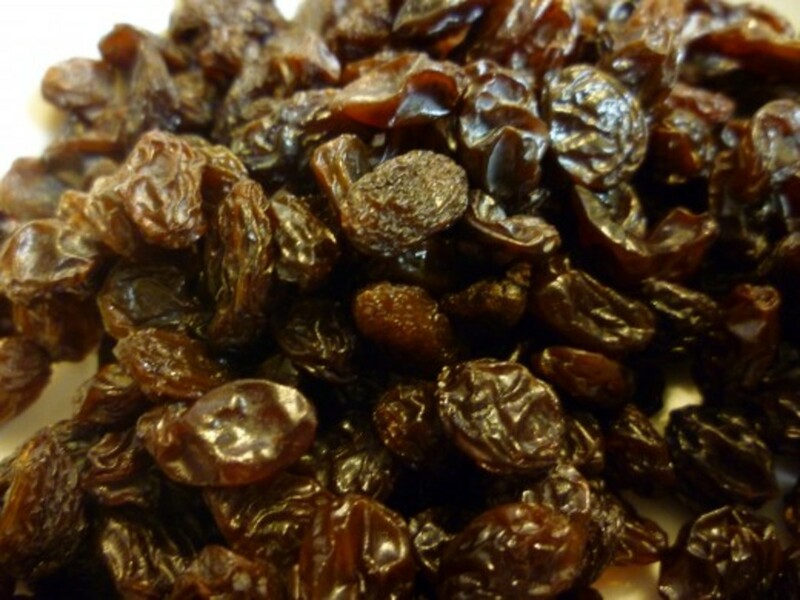 Raisins are cholesterol and fat free and provide iron and potassium along with fiber. So while most cookies are not exactly listed as health foods, at least these Quaker Oats Oatmeal Cookies with the added raisins and walnuts boost the health benefits as compared to other types of cookies that simply contain refined white flour, sugars and spices. You can afford to indulge yourself and have an occasional cookie like this on occasion. If you like this cookie recipe, please put some stars on it. Thanks! For many years my mother and I worked together in making tried and true cookie recipes for gift giving purposes during the Christmas season. Sometimes we would try a new recipe and would add it to our list if we liked it. But for the most part, many of these recipes date back many years and even to past generations from which they have been handed down. Several years ago I continued that baking tradition but no longer had the company and helpful hands of my mother as she had passed on to the next life. Cutting back to only 10 different kinds, the tins that are now readied to be given away still have a nice assortment. Since these Quaker oatmeal cookies have been made as a part of the gift assortment for numerous holiday seasons...and before that filled lunch boxes when we kids went to school decades ago...many sweet and nostalgic memories go into making of them each year. Hope you enjoy baking these healthy oatmeal cookies for your loved ones or bake some Quaker Oats oatmeal cookies to give away as gifts. I'll bet that you get compliments and smiles! 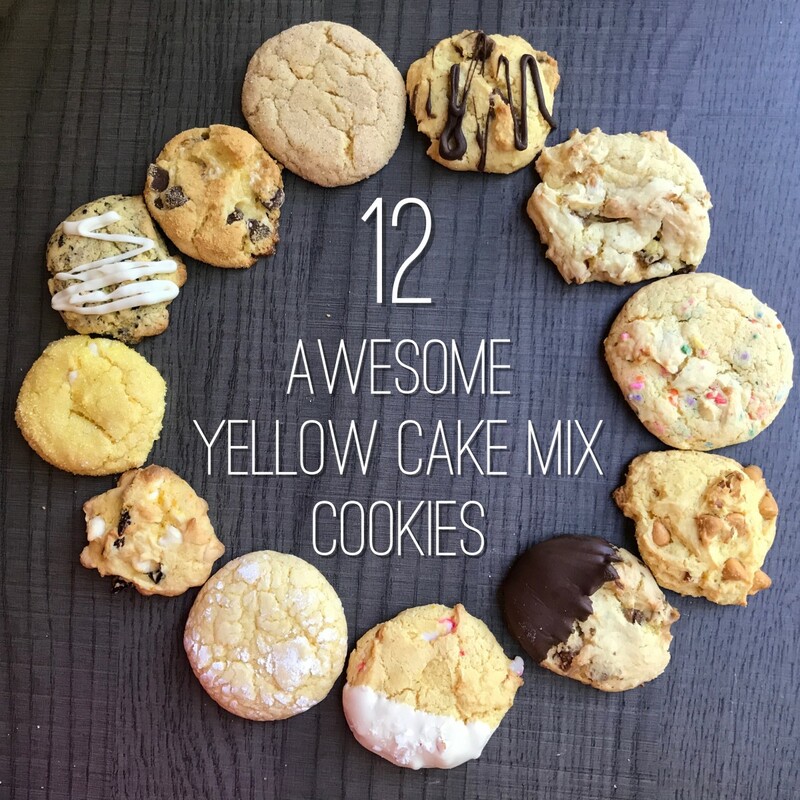 Do you enjoy making homemade cookies and giving them as gifts? I like baking homemade cookies but do not give them as gifts. I do not bake cookies. I do not bake cookies but would not mind receiving them as gifts! I do not eat cookies on a regular basis but my husband enjoys eating about one a day. So I do bake these oatmeal cookies quite often for him. We freeze most of them and just thaw a small number at any one time. Oatmeal cookies are right up there as far as a favorite for me also. I am sure your grandson Jay will like these. Hard to believe but Thanksgiving and then Christmas will soon be here! Good morning Adore these cookies and make them by the recipe on the box often but I adjust the sugars as I often feel they call for much more than is needed. They are my grandson Jay's favorite. I did not compare your recipe to theirs ...it is of little import to me....I will use your recipe this month when I make my first batch of the season...I take them on Thanksgiving Day (and Christmas) as a special treat. Hope you enjoy these flavorful oatmeal cookies. Thanks for your comment. Will try to bake some as I think this is much more healthy. Sorry about that! Hope you are not on a reducing diet. Ha! These are really good cookies! So glad to get that feedback. Thanks! Enjoy the cookies! Just wanted to let you know I made cookie bars from this basic recipe last Saturday. They turned out great! At first I thought they weren't quite as I wanted them, but after letting them cool off and putting then in the frig, I had some again a few hours later. Removed a couple of bars from the pan and nuked them in the microwave for 20 seconds to get them warm again, and they were scrumptious!! I love them. I changed the recipe up slightly. I added the cinnamon as you suggested, doubled the brown sugar to 1 full cup, and substituted the shortening for a half cup of cooking oil -- I used olive oil. I also added another tsp of vanilla (total of 2 tsp), and used 2 eggs instead of just one. I sprinkled granulated sugar on top of the batter after spreading it in a greased 9x11 pan. Spreading the batter was a bit of a challenge, but with patience it worked just fine. Baked for 19-20 minutes at 350 degrees. Excellent! Will be interesting to know the results of your experiment. I would just wait until you have an egg to try this recipe. Not sure that mayo would be a good substitute for an egg in this recipe. Sorry it took so long for me to respond back. Wishing you a happy holiday season and new year. Hope you enjoy this old fashioned and tasty cookie recipe. can i substitute the egg with 1 tbsp of mayo? I don't have applesauce either and I ran out of egg. Your cookie board must be growing by leaps and bounds. Appreciate your liking the sound of these oatmeal cookies enough to vote upon and share. Thanks! Oh boy another cookie recipe, pinned. I also shared and voted, stars. I enjoy your cookie hubs. You are living without an oven? I guess from what I have read about where you are living, the food is so good, inexpensive and readily accessible that ovens are not that great a necessity. Must be nice. I think that I would miss mine, however for such things as these homemade oatmeal cookies. Thanks for the votes and shares! Makes me wish I had an oven .... oatmeal cookies are great! However, I'm sure a few of my followers have a full kitchen, so will share and tweet. Another delicious-looking recipe. I like the way you have added useful links, and have voted this up. I have also added it to my Recipe Index for HubPages. Am sure you will enjoy these tasty healthy oatmeal cookies when you get around to baking them. They are good! Thanks for your comment. I am adding this hub to my Recipe Index for HubPages. Hope you enjoy these oatmeal raisin walnut cookies as much as we do. I'll be making another batch soon! Thanks for your comment. I love oatmeal cookies. I was going to bake cookies tonight. I just now decided what kind. Thank you for your great recipe. Thanks for commenting and sharing this oatmeal cookie recipe with your daughter. I'm not sure what you mean by thick rolled oats. I use the regular longer cooking type...not quick cooking or instant. Hope that answers your question? Nice combination...getting your favorite oatmeal cookies while contributing to a good cause! Glad that you found this hub via alocsin's sharing of it. Appreciate your comment. Peggy this is a delicious recipe hub article! I don't bake cookies, but my youngest daughter loves to bake them from time to time. I know she will love whipping these up :). Voted up + awesome! 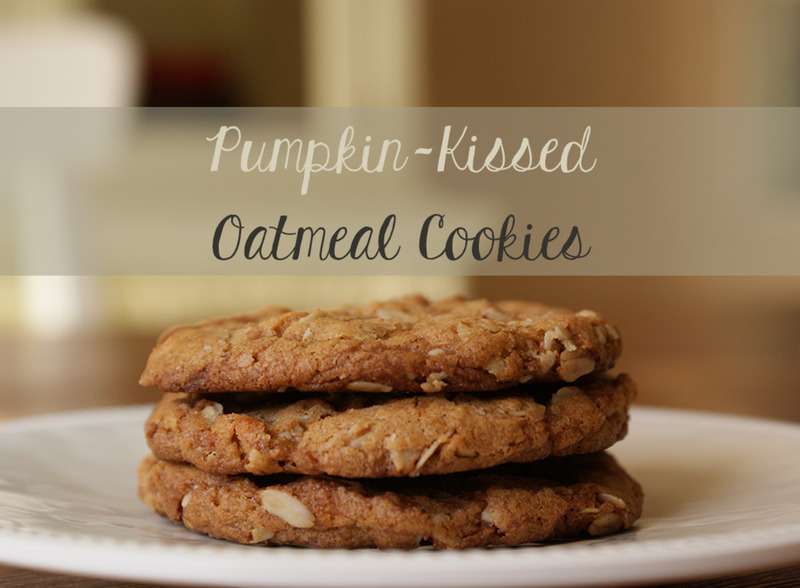 Question: have you ever tried baking these using thick rolled oats? If you have, how did you adjust your baking time? So glad that you liked this healthy oatmeal cookie recipe. Thanks for the votes and especially the sharing of this hub with others. You know, Peggy W, I've already commented but every time I see this post I have to stop by. Oatmeal cookies really are my favorite. NOW, I'm going to share this with my blog fans on FB. I know my readers will love it. I just love your recipe hubs. Not only do you offer a delicious way to bake oatmeal cookies, but you also points out the health benefits. Voting this Up and Useful and Sharing. Hope that you and Dai like these oatmeal cookies as much as we do. Thanks for your comment. I am moving onto your recipes now Peggy and this one is great for me to bookmark because I am on a healthy eating period(sort of). Another great recipe for me to add to my growing collection. Take care my friend and enjoy your day,. Thanks for your comment. 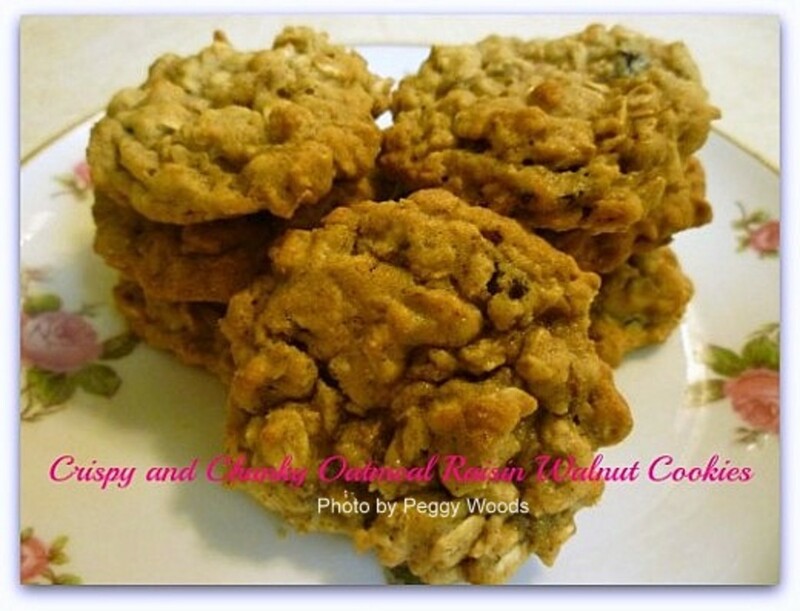 Hope that you enjoy this healthy oatmeal raison cookie recipe. It is really good! Thank you for passing this along and sharing. Blessings! 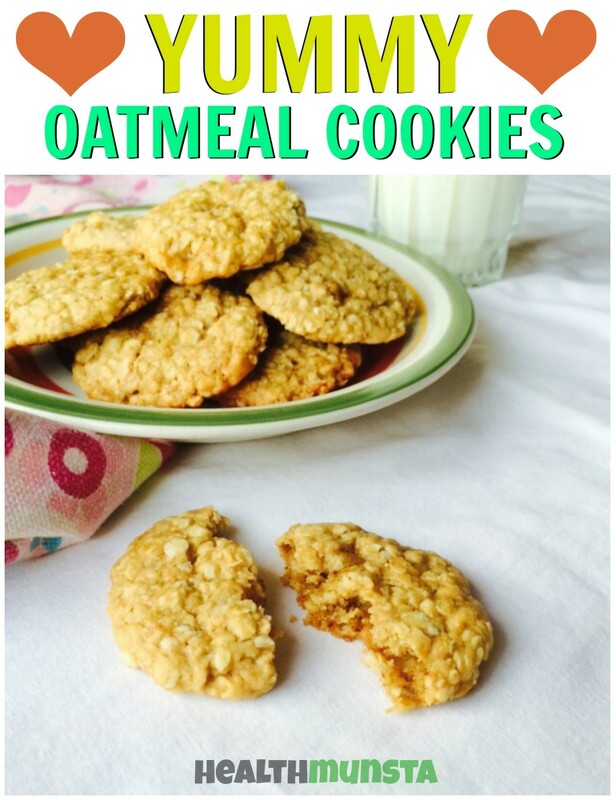 Enjoy these healthy oatmeal cookies! Glad that you liked the photos and directions. Thanks for your comment and votes. This combination in a cookie is sure one of my favorites! I definitely have to try these. Great hub and great photos. Thanks for sharing! Hope that you enjoy this oatmeal cookie recipe as much as we have over the years. Thanks for your comment. This recipe looks good and it is nice to find a recipe idea for a 'treat' that has healthy ingredients like oats in it. 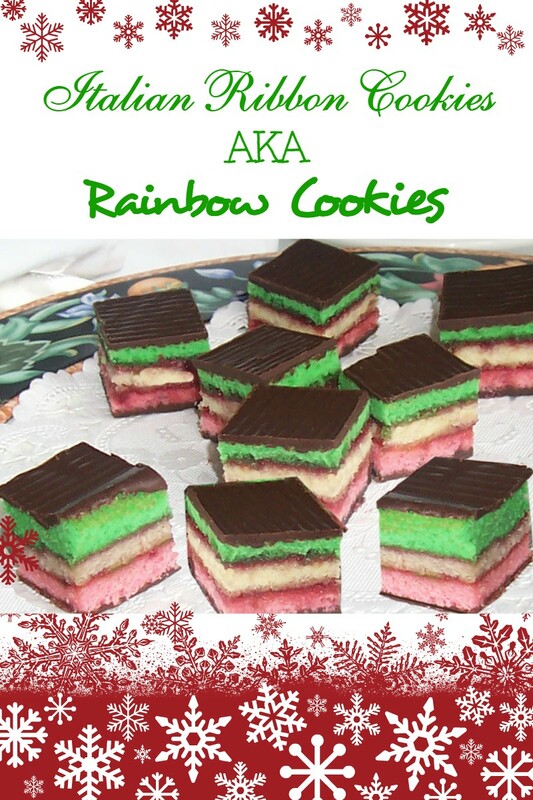 I might give this a try as the cookies look tasty and I think it would work with other variations too. Thank you. I agree with you. Homemade oatmeal, raison, walnut cookies are probably my favorite also. Glad you liked the recipe and thanks for your comment and votes. Absolutely LOVE homemade oatmeal, raisin, walnut cookies. They are my utmost favorite. Thanks so much for sharing the recipe. Voted up and useful. It is a good cookie recipe! Everyone that has ever eaten it seems to really like it. Hope that you do also. Thanks for your comment. I'll have to try this recipe Peggy! Sounds yummy! Hope you like these oatmeal cookies as much as my husband does. Let me know what you think if you decide to make and bake them. Thanks! Thanks for this recipe, I will definately try it. These oatmeal cookies are really good! Hope you enjoy them! Thanks for the comment. These healthy oatmeal cookies are good. If you decide to bake them, let me know what you think. Thanks! Peggy, these cookies look delicious. Awesome. Voted up! Hope that you enjoy making, baking and eating your healthy oatmeal cookies. Thanks for your comment. Interesting and delicious article in here.Am already in love with oatmeal cookies.sounds and look tasty and i will surely give it a trial. I think if you bake these healthy oatmeal cookies, Katie, they just might become a favorite! Thanks for the visit and comment. Hope you enjoy these healthy oatmeal cookies! Oatmeal cookies,one of my favorite cookies without a doubt! Thanks Peggy for a great Recipe! I got the idea from Alton Brown to make oatmeal cookies using homemade oat flour instead of all-purpose flour. You just take some of your oats for a spin in your food processor. It makes them even better for you and it gives them an even more "oaty" taste. 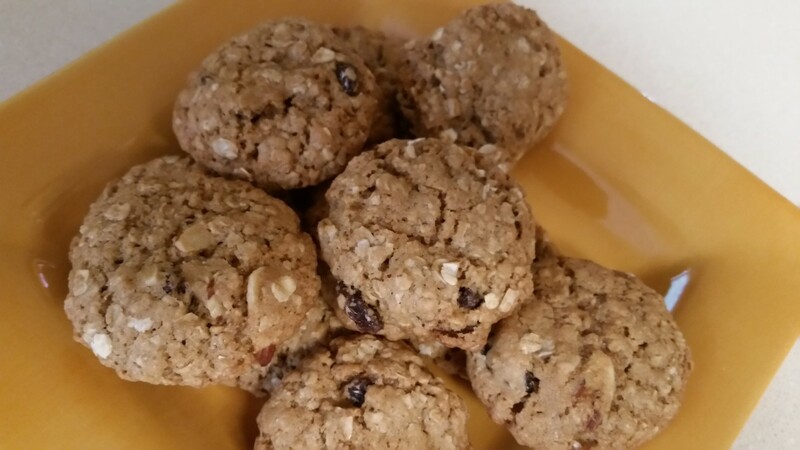 Let me know if you liked these healthy oatmeal cookies after you try them. If you are baking these oatmeal cookies for your family you just might be tempted to give them as gifts also. Everyone here loves them. Thanks for the comment. Good hub, I love oatmeal cookies, I am going to try these, thanks. Yes...if you are going to eat cookies you might as well eat ones that have some health benefits like these oatmeal cookies. Besides that...they taste wonderful! Happy to share the recipe. 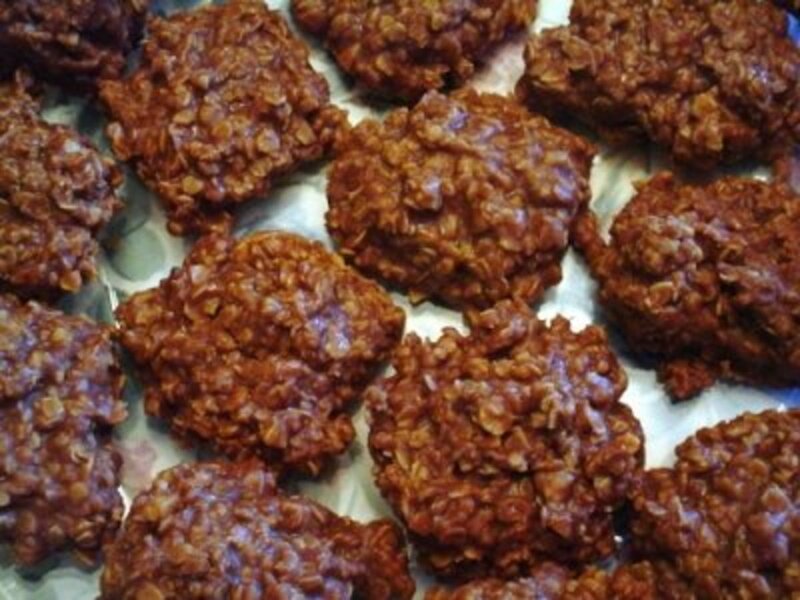 These oatmeal cookies are not only tasty but good for you also - thanks for sharing the recipe Peggy. "I must have been a horse in previous life - I love oats." That's funny! You are lucky in that oatmeal is good for you and relatively inexpensive. So just keep eating that oatmeal! Glad you liked this healthy oatmeal cookie recipe. Every year when I do my Christmas baking, Quaker Oats oatmeal cookies are part of the mix. Thanks for the comment. This is a wonderful recipe and I must have been a horse in previous life - I love oats. Let me know what you think after baking these healthy oatmeal cookies. Everyone that I give them to seem to really like them and always ask for more. God Bless you also and thanks for the comment. Thanks for the comment on this healthy oatmeal cookie hub and baking but mostly for the blessing. Peggy, oatmeal cookes are on my top cookies list. This look like a great Xmas gift. Thanks for sharing this and sharing your thoughts. I'm sure this holiday will hold some bittersweat memories for you. God bless. Thanks for taking the time to look at this hub about healthy oatmeal cookies and baking and thanks for the comment. You have some cookies waiting for you! Glad that you appreciated this healthy oatmeal cookie hub. Your oatmeal breakfast sounds like a real health booster! Thanks for your comments and additional information. A lot of love goes into preparing each batch of cookies. I agree they are very healthy and very delicious. I feel your emotions about your lovely and precious mother. A great recipe and a wonderful hub. Thanks so much for passing down this family recipe for oatmeal cookies. I'm glad you are carrying on a scaled down version of your cookie baking tradition despite your Mother's passing this year. I'm sure the memories were bittersweet but I'm sure it wouldn't have felt right not doing any baking as your family loves the cookies so much. Thank you also for pointing out the cholesterol lowering effects of the oatmeal and walnuts ingredients and I'd like to remind people of the obvious- that adding the walnuts to a bowl full of oatmeal for breakfast is also very effective and has less calories. A 1/2 to 1 teaspoon of ground cinnamon also lowers cholesterol. My own cholesterol levels dropped 30 points when I made the above part of my daily routine. Saved it. this recipe has been added to my file! Thanks much. I voted that I bake sometimes when I don't. But - I will bake these cookies darn it! Oatmeal cookies for breakfast? I guess that these healthy oatmeal cookies would be as nutritious as those bars that people buy to have on hand for quick nutrition. As to baking them, that is the easy part. Hope you like them! This a practical recipe so that can be prepared quite fast, not to mention its benefits for health. I think I can try it for my breakfast. Happy to hear that you liked this healthy oatmeal cookies and baking hub. I don't know if the brand Quaker Oats is in your side of the world, but any old fashioned oats will do just fine in this recipe. Thanks for your visit and vote. Good morning, Peggy. You give healthy recipes here. Oatmeal is the best ingredient to support our heart. You made oatmeal more delicious with your recipes. Thanks for share and I give my vote to you. Have a nice day! Understood! Sometimes there is just not enough time in the day to squeeze another thing in...like baking oatmeal cookies to give as gifts. Glad my baking is done for the season! I have people who expect them every year since this is now a tradition. I've never seen that size Quaker oatmeal, but we don't have Costco, in fact I have never been to one.However, oatmeal is pretty much generic.Rose does not bake. I have tried it occasionally but I do not want another chore added to mine. Those tried and true recipes are like gold. Your oatmeal cookie recipe is undoubtedly also a winner. Thanks for the comment. Hope you enjoy these healthy oatmeal cookies when you give them a try. Let me know what you think after tasting them. Thanks! Peggy, Those cookies look good. I have an oatmeal cookie recipe that I have used for some time now after trying dozens of recipes that I my husband adores but I think your hub was very well done. The pictures are great and the instructions are clear. We buy the large Quaker Oats oatmeal (100 portion size) at Costco and it is a bargain purchasing it that way. Comes in two bags inside the large box and as the oats are dry, they keep well. You are I are of an age that we remember "free" things like plates, glasses and such being inside of boxes of purchased items. Those days are long gone! Ha! Do you or your wife do no baking? Bet you would like these healthy oatmeal cookies if you gave them a try! I have a recipe for muesli cookies that is somewhat similar to this. But this sounds even better, really! Will give it a try soon - just need to get some oats! I use old fashioned oatmeal for breakfast but do not buy the name brand.I wonder what ever became of Mother's Oats back when I first got married they sold it with a piece of tableware like a plate or saucer in it. Your cookies sound good. I think my mother made oatmeal cookies. These healthy oatmeal cookies are yummy. Give them a try and let me know what you think. Be sure and use the old fashioned Quaker Oats or a similar brand of whole oats. Thanks for the comment. Let me know if your daughter likes this healthy oatmeal cookie recipe after she bakes it. We think it is great. Thanks for the quick comment. Very detailed! I will pass it on to my daughter, she likes baking! Good hub and keep up the good work!